Do you want to improve your hospital’s inpatient pharmacy? Whether you want to offer new services, enhance your current structure and make it more modern, or if you want to keep up with the latest pharmaceutical trends and technological advancements, Danco Medical Systems is here to help. We offer grade-A Pharmacy Fixtures in Tipp City, Ohio. Pharmacy layout. The layout is a vital part of design and remodeling. 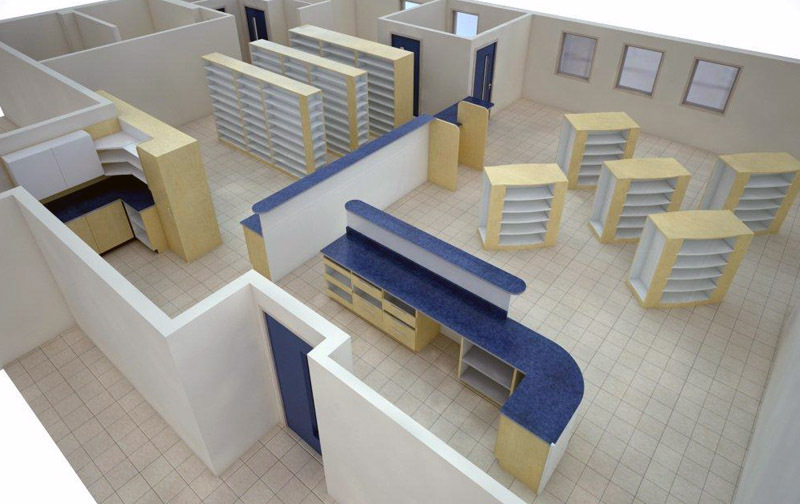 When planning the layout for your pharmacy, take the necessary steps to make sure available space is used in the best possible way. Proper positioning of counters and workstations are important parts of this process. The right design. Colors, style, visual effects, and texture are all aspects of design. While you might still need to comply with the hospitals’ overall design and style, make sure that your inpatient pharmacy looks well-organized and functional at the same time. If the layout is for maximizing the use of space, then the design is for using the space to help your inpatient pharmacy staff do their jobs more efficiently. Dispensing and prescription. These areas are the core of your inpatient pharmacy and have to be conducive to high quality, productive work. Your employees have to be able to move freely within these areas without any disruptions whatsoever. For designing or remodeling the prescription area, one needs to consider the efficiency of the workflow process. Appropriate shelving. Your pharmacy has to be flexible and versatile so that in the event of any changes, the process of adapting would be lower of cost and less disrupting to regular hospital operations. If you’re planning to design or renovate your inpatient pharmacy, partner with the right people. Danco Medical Systems addresses all the necessary aspects for pharmacy growth and development. Whether you’re looking to modernize your Hospital Pharmacy Design in Ohio, New York, California, Washington or any part of the USA, you can count on our company to do the job right! We help speed up your USP 800 Compliance and we’ve got you covered every step of the way. Don’t hesitate to get in touch with the right provider today! This entry was posted in Pharmacy Remodeling and tagged Appropriate shelving, Pharmacy Design, Pharmacy layout, Pharmacy Remodeling Tips, sterile compounding. Bookmark the permalink.